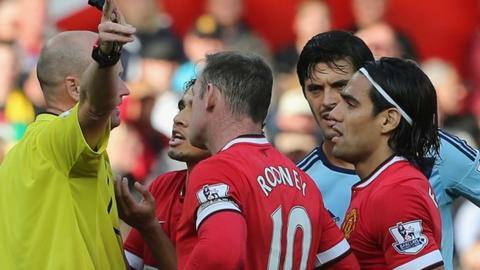 Wayne Rooney's red card for Manchester United will claim the headlines from an eventful Saturday in the Premier League. The United and England captain must now serve a three-game ban - but the good news for manager Louis van Gaal is that his 10 men held on for a crucial win against West Ham United to ease some of the wounds from the 5-3 collapse to Leicester City. This was among a number of key talking points from Saturday's games. Here, we look at Rooney's conduct and some of the day's other significant incidents. Is Rooney struggling with pressure of captaincy? While Rooney's reckless lash out at Stewart Downing was irresponsible and put Manchester United under pressure as they tried to protect an important lead, it is an offence that should be placed in context. This was Rooney's first red card for United in five years and comes at the end of a long spell when he has seemingly curbed his more aggressive instincts - even to the point where some suggested it had taken the edge off his game. So to suggest Rooney, who believes his best years are yet to come, has suddenly reverted to bad old ways is premature and ignores much of the recent evidence that has seen him much cooler than the hot-tempered earlier days of his career. One factor has been introduced into Rooney's life recently, however - his appointment as permanent captain of both club and country. And this may be an area of concern for those who want this wonderfully talented player to continue to have a clean record. As a personality whose default position is to take complete responsibility for all aspects of his team's display, it was clear how furious Rooney was with his United team-mates when they cast aside a 3-1 lead at Leicester City. He was visibly angry at the manner in which they conceded their advantage. And it may be an area Van Gaal feels he needs to address after he followed this up so swiftly with that wild kick out at Downing that earned him a deserved straight red card. Rooney's performance and effort levels do not need lifting by the award of the status of captain - his desire and determination will be the same whether he has the armband or not. But there is no doubt Van Gaal and England manager Roy Hodgson will be watching for vital signs that the cares and responsibilities of captaincy do not lead to Rooney placing increased pressure on himself and leading to the sort of incident witnessed at Old Trafford on Saturday. Former Manchester United defender Phil Neville on Match of the Day: "When Rooney made the foul I thought United must have been in trouble at the back but United were four against two and all the defenders were in good positions. It was just a reckless tackle. There's no need to make the foul because of the position the United defenders were in." Ex-Wales striker John Hartson on Final Score: "Rooney kicked out at Downing cynically and caught him in the thigh area for no reason whatsoever. And you just ask yourself 'why?' Only he himself will be able to answer that." Former Chelsea and Newcastle manager Ruud Gullit on Match of the Day: "He could have just tripped him but he just lashes out. Sometimes he gets these moments in his career." JB on text: Watching Man Utd is the most thrilling part of my week now. It doesn't matter how many they score as we know they can concede twice as many! Always praying as soon as the ball goes over the halfway line that it doesn't end up in the back of the net! Bobby in Newcastle on text: Awful conduct from Wayne Rooney. The Man Utd and England captain should know better than that! Sean: Just when you thought Wayne Rooney had grown up he does that. A toddler throwing his toys out of the pram. Should not be captain. Is the title battle a two-horse race? With each week that passes, the Premier League looks more and more like it will develop into a straight fight between Chelsea and reigning champions Manchester City. Both showed their potency in front of goal again on Saturday, Chelsea winning 3-0 against Aston Villa while City had the firepower to overcome conceding a two-goal lead to win 4-2 at Hull City. The key to Chelsea's fortunes may be the fitness of Diego Costa, who scored his eighth goal of the season against Villa but is still having to manage hamstring problems. Chelsea manager Jose Mourinho revealed Costa is currently barely training to protect the injury and he will hope this continuing concern does not have an impact on their season as he has already proved so vital. Mourinho has the very able Loic Remy as back-up, having suffered from a lack of alternatives last season, but Costa is the big gun and he will not want to be without him when it matters. Sergio Aguero also has a chequered fitness record at Manchester City but one glance at the strength in depth of both their squad and Chelsea's suggests we should look no further for the champions. One interesting sub-plot for City was manager Manuel Pellegrini's decision to rest England keeper Joe Hart against Hull City and bring in understudy Willy Caballero. This was surely only to keep Hart back for Tuesday's Champions League game as he has been in excellent form so far this season. Southampton stand between Chelsea and City but even the most optimistic Saints fan would not expect that state of affairs to continue - and while the likes of Arsenal and Liverpool may have title aspirations, on current evidence it is hard to see how they will come to fruition. It may be less exciting than having four or five teams jostling for position - but these are two high-class sides who will provide plenty of quality. Gullit on Match of the Day: "The difference with Chelsea this season is the work they do in getting the ball back. The first goal was a great goal and I love the second goal - they still find spaces. And when the opposition is going forward, they also have the possibility of going for a counter-attack. This is the Chelsea I love to see. It's a Chelsea that's hard to beat." Ex-Leicester striker Steve Claridge on Final Score: "I just don't know how many teams will come to Stamford Bridge this season believing they can get a result. If you came here before the game and you wrote a script of what you thought would happen, the game played out exactly as you might have imagined. So an archetypal Chelsea performance - they looked very, very good." Chelsea defender Cesar Azpilicueta: Great win to keep us on top of the table! Now turn to champions! Manchester City captain Vincent Kompany: Great game of football ... again. We're on track now. Man City striker Sergio Aguero: Vital three points to keep ourselves in the race. Our minds are now on Tuesday's Champions game. C'mon, City! As the revolving door spun at St. Mary's in the summer, many predicted meltdown after the departures of Luke Shaw, Dejan Lovren, Calum Chambers, Rickie Lambert and Adam Lallana - as well as manager Mauricio Pochettino to Spurs. Saturday's win against QPR was their sixth in succession and continued a superb start under new boss Ronald Koeman that has them in second place, sandwiched between leaders Chelsea and champions Manchester City. The departures have been compensated by shrewd signings such as Graziano Pelle and Dusan Tadic, as well as the determination to keep Morgan Schneiderlin. Throw in the usual array of fine academy products and Southampton's position was never going to be as grave as some pessimists predicted. It is stretching reality to breaking point to claim Southampton will emerge as top four contenders but all the signs are there that this will be another very satisfactory season at St Mary's under one of European football's most respected and experienced figures in Koeman. Neville on Match of the Day: "I tipped Southampton to go down at the start of the season but they've been so impressive. They are vastly improved." Southampton striker Graziano Pelle on Twitter: Always dreamed to score a goal like today. Great result for my club @SouthamptonFC and our fans. Paul Adam on Twitter: Who does Pelle think he is? Pele? Are Spurs moving in the right direction? The trademark of Mauricio Pochettino's time at Southampton was his devotion to a high-tempo pressing game that made life so difficult for opponents, allied to the quality he possessed in his squad of course. It was clear from his body language on the touchline during Tottenham's 1-1 draw with Arsenal in the north London derby at Emirates Stadium that he will be demanding the same from his new charges. The Argentine cut an ominous figure in his technical area and one of his trademark gestures - and admonishments when it did not happen - was constantly ordering his players to close down Arsenal in possession. Twice in a matter of seconds in the first half Emmanuel Adebayor and Christian Eriksen felt the rough edge of his tongue for failing to follow managerial orders. The Dane responded in the manner required by , stealing possession off Mathieu Flamini early in the second half to set up Nacer Chadli's goal as Spurs earned a deserved point. It may take time for Pochettino to get things as he wants - but one look at his demeanour tells you the direction he wants to head in. Neville on Match of the Day: "When you look at Pochettino's team last year at Southampton, they played with high intensity. I think he's had to change that tactic at Spurs because of the personnel he has. Against Arsenal they looked to counter-attack with speed. They were the better team in the first half and they had the better chances." Asim S. Tanauli on Twitter: Strong line-up by Arsene Wenger but I don't understand why Santi Cazorla isn't being played that much. Daniel Jones on Twitter: What exactly are Arsenal's training methods? They can't seem to go a single game without a player picking up an injury. Jamie from Lincoln on text: The season's just started and I can't remember feeling more disappointed. I think Wenger needs to go, and bring in a manager who wants to win trophies. Sorry, but Wenger knows our weakness and for years he hasn't strengthened. Time to go, Wenger. Can toiling Liverpool rediscover their X-factor? While Liverpool manager Brendan Rodgers saw signs of improvement in Liverpool's 1-1 draw with Merseyside rivals Everton at Anfield on Saturday, there is no doubt they have yet to come anywhere near the scintillating form that took them so close to the title last season. The 3-0 win at Spurs apart, Liverpool have struggled to repeat the fast, dazzling attacking football that destroyed so many teams last season - often very early on in games. Much focus will be placed on the loss of Luis Suarez to Barcelona and on a one-to-one football basis he was close to irreplaceable. The injury sustained by Daniel Sturridge on England duty has not helped either. The removal of some cutting edge has highlighted defensive deficiencies that were in evidence last season but often disguised by the brilliance of their attacking. Rodgers, however, remains optimistic and it is understandable - although he will want more from £16m striker Mario Balotelli, while £20m Lazar Markovic looks, to put it very kindly at this early stage, as if he is struggling to come to terms with the Premier League. Liverpool will hope the return of Sturridge will give them back some threat and offer more worries to opponents, particularly in tandem with Raheem Sterling. It has been a poor start for the team who had the Premier League title in their hands until almost the final games of last season - but Rodgers is right to insist these are early days. Neville on Match of the Day: "I've never been a fan of his but I saw signs today that Brendan Rodgers has got Mario Balotelli playing for the team and not just for Mario Balotelli." Former Crystal Palace manager Tony Pulis on BBC Radio 5 live: "Everton will be delighted with the point. Liverpool were the better team, so Roberto Martinez will be the far happier manager." Liverpool striker Daniel Sturridge: Gutted... We were unlucky today. I'm closer to fitness each day and working hard to return to help the team. Everton defender Phil Jagielka: Happy to have scored my first goal in a while! Great team effort today! QPR midfielder Joey Barton: Steven Gerrard shut up one or two of his recent critics with a superb free-kick. Thought Mario Balotelli had a go today. Looked like he cared at least. Chris White on Twitter: No surprise Martinez has ruined Everton's defence. There was a very good reason Wigan went down - Martinez is massively overrated. Can Warnock match Pulis's Palace feats? Crystal Palace's 2-0 win over Leicester City at Selhurst Park means they are now unbeaten in four games under new manager Neil Warnock. Selhurst Park was a tough place to be earlier this season when they lost their first home league game in miserable fashion to West Ham United. Tony Pulis had left and Palace were rudderless - Warnock has come in and restored stability to the ship and confidence is back. Warnock may be an acquired taste as a manager, and some have never acquired it, but no one can argue that he has come into the club and restored the sort of belief and resilience that was so crucial under his predecessor Pulis when Palace did so wonderfully well to survive in the Premier League last season. Crystal Palace striker Fraizer Campbell on Twitter: Great back to back wins against a team with loads of confidence. Lads were quality today. Also good to get off the mark at Selhurst! Palace midfielder Joe Ledley on Twitter: Nice to get a win on my first game at Selhurst Park this season! Brilliant team performance for a big 3 points.